← It’s the Olympics. Why Not Skate? … was delightful. Please visit his site and read about our visit together. 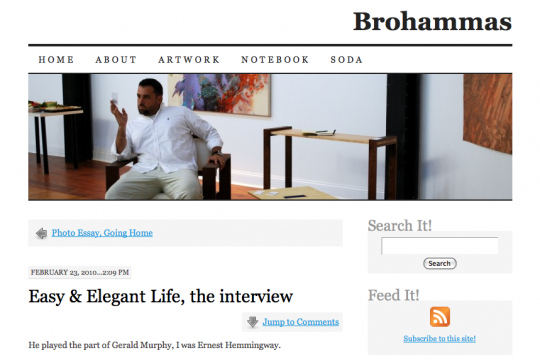 This entry was posted in Entertaining and tagged Brohammas, Easy and Elegant Life. Bookmark the permalink. He did a very nice job. And it was great to learn more about you. Tintin, he is an interesting man. If he makes it to your ‘burg, I recommend taking him to lunch. insights about Mr. E&E. Yes, attitude counts, but custom clothing and always being dressed for the occasion brings confidence. Isn’t that the E&E philosphy? b, yes and no. Clothing that fits is very important to me. Style is something apart from elegance, usually. One can have great style and not be elegant. Johnny Depp is a prime example. Always being dressed for the occasion is a great concern for me. Brohammas broke out a sportcoat, well suited to his frame, for the luncheon. That said volumes. His manners would have overcome any situation at which he may have felt at a disadvantage. And that’s where the right attitude comes in. Thank you for your response. You are so right about the importance of attitude and manners. Very nice. I particularly like your restraint when prodded about the horror of jeans and tradeshow garb. You are all very kind people. I’m going to have my wife read that comment about my manners… she will be shocked. Sounds like a lot of fun. I enjoyed hearing someone else’s perspective on Chris and his goal to maintain civility, elegance, and courtesy in a world that seems to have other priorities.